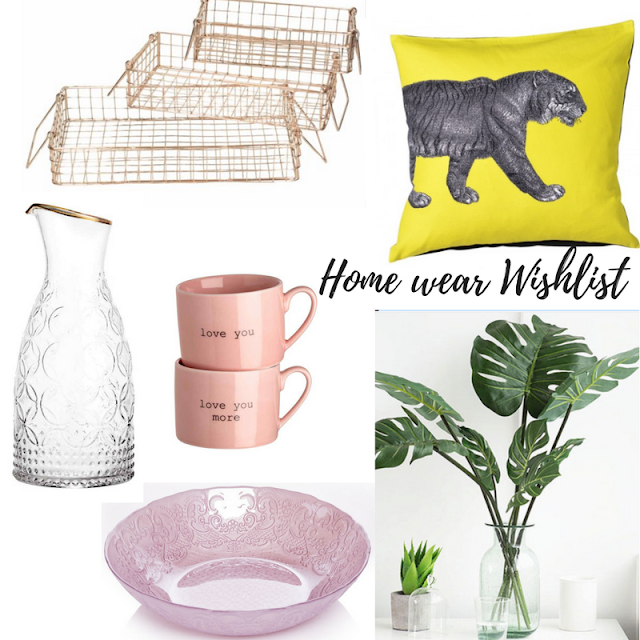 I havn't done a little home wear wish list in a while so I thought I would put one together. I have pretty much filled my home now but that doesn't stop me from browsing the internet and looking at pretty things! Our next to do is the garden so I should probably be looking at that instead. However, I'm not, I'm looking at cute pink cups from H&M and this beautiful glass bowl that is an absolute bargain from Wilko. I LOVE these yellow leopard cushions from Crown French Furniture, these actually might look pretty cool in the garden! And I could use this pretty carafe to serve drinks on sunny days too! I really would like to add more house plants in to our home as well however, I'm worried that Bentley (our dog) will be tempted to try and eat them so these fake leaves could be a good alternative! Lastly I really like these copper wire trays, I really dont need them and have no use for them but they are cute so I'm sure I would find a use. I hope you like this little home wears post and I hope it enables you to buy something pretty :).